Is this the nest possible version of this track going around?? Or is another update on the way? If so, great. Otherwise it needs some work. When you get anywhere near the walls on the exit of the chicane, or any part of the circuit where there are poles holding up the track walls, If you happen to touch the wall, the nose of the car gets 'grabbed' by the wall and you spin around. This isn't realistic at all. Not only should these poles be on the other side of the fence, but The car should react properly and glance off the wall. Not spin around. Other than that, it is a great track. Can someone possibly upload to different mirror, mediafire just doesn't seem to work for me. this track is fun. just playing the beta is immense. just a couple of things. 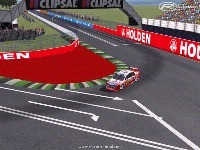 the cam at turn 2 needs to be moved slightly further forwards as middle to exit of the corner is blocked by a tree. also the chicane should be sharper. i can get through it flat out by just hopping the curbs whilst the ai spend hours going in and out. the final tire should be slightly tighter so tht u hae to break to get round it. This is the latest version in its own thread at FVR called Hamilton 400 WIP6, surprised you couldn't find it. Thank you for your reply FlashQld... I found the track on FVRFactor.com, extracted the rar achive in the exact folder structure as found in the archive (rFactor\gamedata\Locations\V8SC\FVRHamilton09\....) But doesn't seem to appear in the tracklist in rFactor, or rFactor Dedicated server. That why I was wondering if I was missing something.. Thanks again. Sorry for my ignorance, im not sure if i'm missing something here, but how does one make this track work with rFactor?